Annual garage door service is essential to ensure your garage door is operating safely & effectively & will extend the life of your garage door & automatic opener. Our garage doors have become our most used item in our homes as the majority of us use the garage as the front door. Problems & costly repairs can be avoided with regular annual servicing. Common problems & complaints with garage doors include getting stuck, not opening or closing, noisy when operating, randomly opening or closing, broken clips & hinges, Broken or unwound springs, cables loose or broken. Book a garage door service with Brisbane Roller Doors today & ask to be added to our data base where we will contact your annually to remind you’re your service is due. Did you know we reward our loyal customers by offering reduced prices on annual servicing? Ask us about this today. Like your car & other products around your home, your garage Roller Door / Panel Door / Tilt Door needs preventative maintenance and servicing. Annual servicing has proven to save you money on emergency call outs & down time. In our experience you can double the life of your garage door by having an annual roller door service. With almost 30 years’ experience in residential, commercial & industrial and roller door service & maintenance, Brisbane Roller Doors technicians are able to provide the right solution for any door type. Preventative maintenance to commercial roller doors & industrial roller shutters is vital to prevent jamming & down time. Where a commercial / industrial roller door is motorised and without annual servicing will send the control box into inch mode creating issues for opening & closing of your warehouse roller door. Annual servicing is vital for the safety of all who use and are near the roller door. Ensuring your roller door is safe for us will prevent any injuries to staff. Brisbane Roller Doors provides the most professional & reliable preventative maintenance in the industry with many of our customers specifically asking for our company as recommended to them. 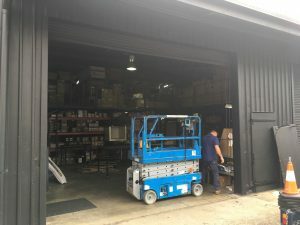 Our technicians perform proper roller door service to all Commercial & Industrial roller doors ensuring smooth & reliable operation of your Commercial Roller Door or Industrial Roller Shutter. There are different levels of servicing floating around in the industry, some cheaper services are a visual check over with no preventative maintenance performed. Visual servicing does not suffice to prevent unnecessary jamming or noise in your roller door. When roller doors are not serviced properly you can face costly call out fees when your roller door won’t open or close as well as unnecessary repair bills. Brisbane Roller Doors has made annual preventative maintenance easy with our 3 levels offered as well as technicians written reports for you to file so you always know what’s happening with your roller door.